You can’t always have a hand free to hold up your bike. Whether you dismount to help a buddy get unstuck, stop to check out the sites, or just park for the night. The Trail Tech Kickstand is the quick and easy way to get a ton of convenience on your next adventure. Trail Tech has put a lot of thought into their kickstand and it shows in the construction. The assembly is purpose built from three separate materials—a high-strength chromoly mounting bracket provides rigidity, a forged aluminum leg keeps weight down, and a reinforced high-impact nylon foot base disperses the weight. With these features built into a kickstand fitted for your exact model of bike, you’ll be well prepared in no time. How much of a difference can a kickstand make? Find out for yourself with the Trail Tech Kickstand. 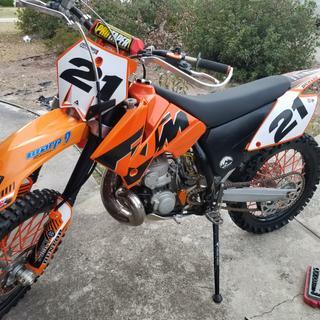 -m-2006 KTM 250 SX-- easy installation and well worth the money. I wish I would have done it sooner. Great product, good fit and quality. Helped me make it easier when stopping in ride, did not have to lean bike on trees any more. Stand stays up when riding and did not give me any issues so far. Very easy to install and parts fit well and did not make me feel bad about altering bike. Finally my bike will stand with no problems! I had problems with my stock KTM kickstand from day one. Finally my bike will stand with no problems! I love the new kickstand! Went in very easy and looks good. I ha e yet to ride with it on but we will see! This kickstand fits great, is lightweight, and looks great on the bike. easy install took about 10 minutes. nice quality and finish. one of the best aftermarket part I put on my bike. no more finding a tree or laying it on the ground! Looks great and works very well. Lightweight and easy to install. Only complaint is that had a large gap on one of the mounting points that required me making a spacer to make it mount straight. This is the best way to stay right side up. How did I survive without a kickstand? My life will be so much better now in the trails. No more looking for a tree to lean the bike against. The little things in life! Would have been 5 stars but one of the two bolts on the kit was way too long and had no nut or washers. Works But has a few things I dont like. It definitely works. but I had to use a different bolt.. The one it comes with doesnt have a nut at the end and just relies on being bolted in instead of locked in with a nut which i feel is a much better option. So i feel it should have just simply came with a nut weather people wanted to use it or not.. Also it sits a little too tall and stiff, doesnt take much force to knock the bike over the other way. I wish there was a little bit of flex at the pivot point to let the bike lean into it more.. So essentially, for the price, im a little bit disappointed. But it's better than NO stand at all and was a pretty simple and sturdy install and was just about my only option other than OEM. I personally feel its more of a $70-$80 product but it sells for double that. Easy to install, perfect fit no mods required. Looks awesome. Must have when you do a lot of trail riding and you don't want to laydown the bike. Feels super strong too. Fantastic! Wish I had purchased this sooner. I have always liked a kickstand on my bikes and todays dirt/motocross bikes just don't come with them anymore. It was a little pricey but i still think it was a good value for myself. Works well, looks good, folds up nicely, light-weight.. We have two. Another great Trail Tech product. Holds the bike up. Looks stylish. Takes the weight of a fat guy on a fat bike no problem. Easy install. Machined holes look good, anodizing is durable. The kickstand works well. It is light yet feels strong. I do wish the spring mount was somewhere besides the subframe bolt because I sometimes need to remove the subframe while using the kickstand. I am in love with this kickstand! best upgrade i have done on my bike period! I race MX and ride trails, the build quality is the best! it has never failed me! doesn't sink in soft dirt, holds the bike in a very stable position and flips up to like a 160 degree angle. And the black looks great! Looks and works great, hardest part was getting old corroded foot peg off. fit great looks good, light and solid, installed in 2 min. installed on my yz 125 2015, just had to cut the subframe bolt as it was a bit too long. Will be perfect in trails!! Great quality stand! I installed it under 20 minuets while working on my bike. Only part that was hard to put on was the spring. Looks great! It is nice in appearance and seems to be well made. It was easy to install except for the spring...that took some effort till I figured out to use some nylon string in a couple loops and a large screwdriver to pull with. Would be nice if some tips like that were in instructions. Also was bit too long and had to use angle grinder to cut off most of the plastic foot to shorten it. Finally, price was bit steep but RMATV was still the cheapest I could find. I installed it on my 1995 Honda CR250. The stand was made for a Yamaha . After welding on a small tab to the sub frame I was able to fit it to my Honda. "Works Great"
Fair, to much for what it is. Shipping was quick. Product seems well build and durable. I look forward to using it when spring hits. Get it, you wont regret it. One of the best improvements ive made on my Honda cr250, hands down. The kickstand looks amazing, built solid, and looks a lot like my KTM's kickstand, which are great lookin IMO. This is an absolute must upgrade for a trails and woods rider. Forget finding a rock or tree to lean up against, use a kickstand dummy. Wish trail tech made this specifically for the 95-2006 KDX. 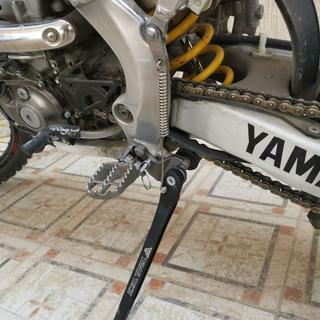 With that said, Great kickstand, works flawlessly, eliminated the swingarm mounted stand. For when you've been riding for hours and you need that 15 minute break. Instead of having to find a tree or large rock to rest your bike against. If you are like me and shop CL for used bikes its easy to get a track bike and ride it for the wrong application... This turned my CRF450R into a nice desert cruiser. Overall it is what it says it is. It seems to be sturdy and well made, time will tell. It is really easy to install, looks good. But it’s a lot to spend for a chunk of metal and a spring. this is a very nice kickstand, easy to install and also has a very good look. Used this to replace the crappy stock kickstandon my 2006 KTM 525. works great, and is built well. installed for single track and works good comes in handy, seems durable. Well made. Replaced a damaged original system and works very well. I really like this kickstand, it fit perfectly was easy to install, I picked this because the black matched my bike best ! But turns out it’s perfect. My kickstand fell off this weekend, but I was able to find it on the trail. The mounting hardware had come loose, so when I called to order the replacement parts from Trail Tech directly (only option available), I was told they wanted $8.95 for ONE bolt, and it'll be $9.99 to ship it. Are you kidding me? $18 for a bolt? I'll be trying to find one at a hardware store instead. This kick stand is lightweight and fits perfectly on the bike,it comes with new hardware aswell,its a awesome product thanks. Quality, solid, easy to install. Comes with instructions which is a plus. Mounts up well and came with nice hardware. 4 stars only because it needs a bump stop of some kind for when you flip it up so it doesn't falcon punch your number plate. But other than that it's solid. A little long for a supermoto but not bad at all. It is so nice to have a kickstand! I did have to use a dremel on one bolt to allow the foot peg to pivot upward, not a big deal. 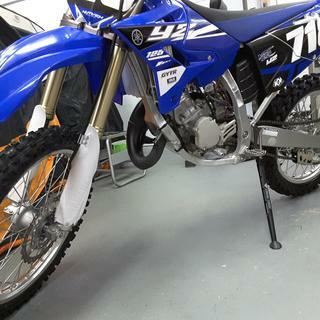 How does this mount on a 2001 yz250? No removable foot peg mount! BEST ANSWER: It has an attachment point at the swingarm where it mounts. There is an installation guide on trail techs website. They have a different unit from what you see on the website that bolts onto the bike frame. It works nicely. On my yz426 it used a subframe bolt and there was another mounting spot right below it. fits in stock location under foot peg, easy installation ,well made!!! 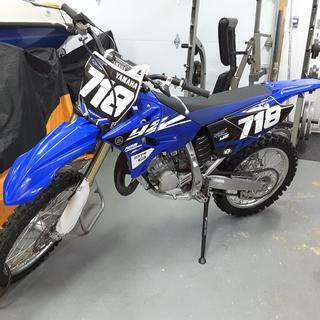 Will this fit a 2018 YZ250F? will this work with tusk foot pegs? BEST ANSWER: Yes, they will work. 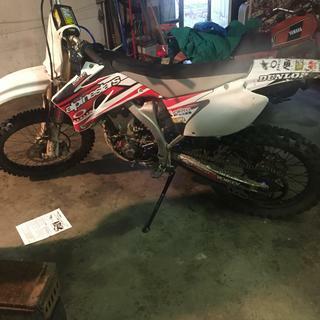 Will this fit a 2015 RM Z250?? Also, bikes don't sit too upright with this stand do they? I am not sure as I ordered the kick stand to fit my bike specifically. My bike sat better on the kick stand than say a bike with a stock kickstand. Very well made product and easy to mount. Hope this helps. You would need to check the application for your bike. But it’s the best aftermarket kick stand on the market. Fits well and works better than factory. No height issue on mine. bike has a fair bit of lean on it with this stand, I block it up when in my shop. This says it will fit a 08 rmz250 does anyone know if it will also fit a 08 rm250? BEST ANSWER: Verify the swingarm height. If it's the same, it will work. It has a nice fit and the kickstand moved out of the way of it becoming an obstruction during normal writing. 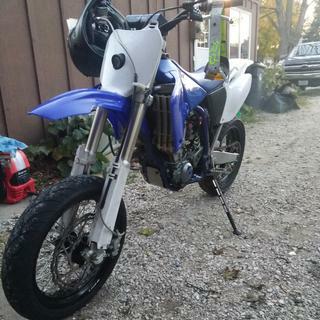 Eugene i put mine on a 2012 YZ250F and it bolted right up im not sure about either of the 08,s you have my guess is if they say it fits it will. 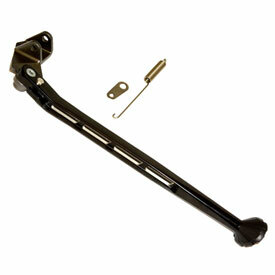 BEST ANSWER: it replaces the stock bracket, not sure if it would fit the new pegs, don't know why they wouldn't. 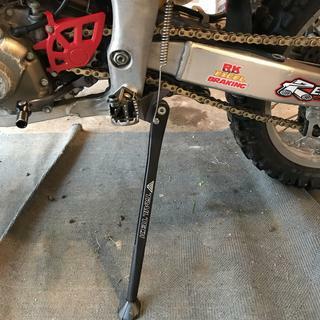 I bought mine for a CRF450R and it replaces everything, used FLO foot pegs with no issues. Uncertain for that year and model. 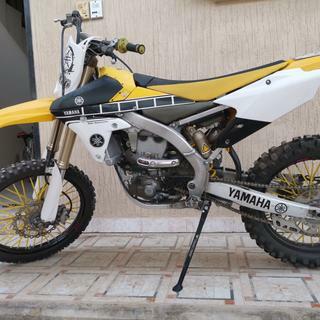 It worked fine as a replacement on my 2003 Yamaha YZ250. 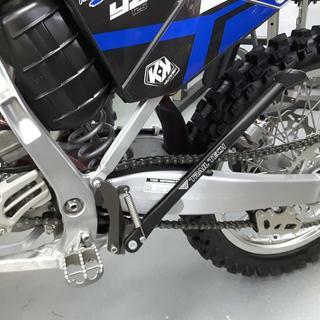 I installed this on my 2009 yz250f and the factory foot pegs won't fit now. So what brand of foot pegs will fit with this kickstand? BEST ANSWER: #1 Ensure you have the correct part # ...refer to Rocky website. #2 Check out the Rocky install video. Mine bolted up with no trouble. I’m sure about any aftermarket pegs. I’m running tusk. Love the kick stand. 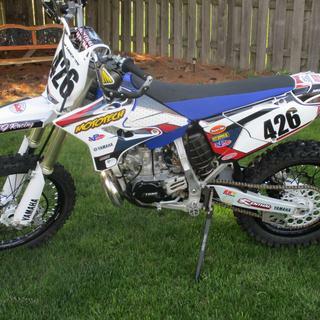 BEST ANSWER: I installed mine on a 2009 yz 250 2t with ims foot pegs fit fine, not sure if frame is the same as yours!! 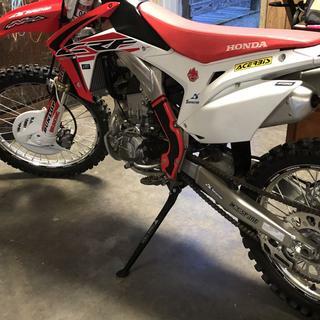 Does this fit a 2017 or 2018 honda crf450r? BEST ANSWER: Yes, this will fit both years of this machine. Will these fit with the Warp 9 oversized footpegs on a yz450f? Will this mount onto my 2008 husqvarna 250txc? What's the length of this kickstand? will this fit a 2000 cr250? 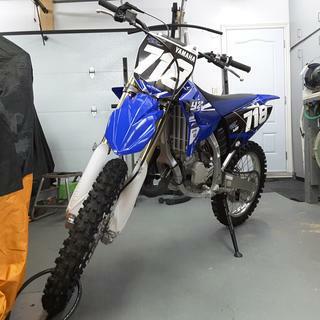 Well it fit on a 1999 yz400f? 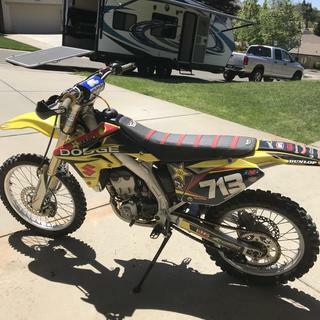 Will this fit a 2006 rmz250?